Given is ΔABC. Let a||b and a∩AC = P, a∩BC=N, b∩AC = Q, b∩BC = M. Construct (ruler-compass) points R, S on AB so that QR||PS and NR||MS. 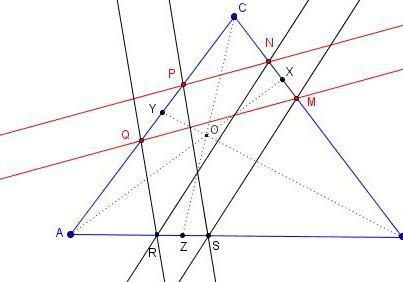 Let Q' and A' be on the ray MP such that MQ' = PQ and MA' = PA, let the line through A' parallel with Q'N meet BC at A''. Then, the lines through N and M parallel with A''A meets AB at R and S respectively. Vladimir Nikolin supplied the following solution. AY/AZ = PQ/RS, BZ/BX = RS/MN and CX/CY = MN/PQ. (AY/CY) × (CX/BX) × (BZ/AZ) = 1. 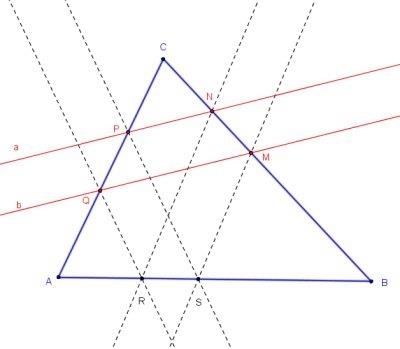 It means (the converse of Ceva's theorem) that triangles ABC and XYZ are perspective in a point. In addition, YZ||PS||QS (PQRS is a trapezoid, YZ is its midline). Construction: Let AX and BY intersects in O, CO and AB intersects in Z. Draw two parallels to YZ from P and Q.
Hubert has come up with a simplified version of his solution: let N' be the point on AM such that QN'||PM, then NN' meets AB at R. I placed his generalization on a separate page.